Walker High's Brian Thomas (4) tries to block this shot by Thibodaux High's Kobi Johnson's (11). Walker High's Jalen Cook (14) is also regarded as a fierce competitor on the defensive end. Walker High coach Anthony Schiro tries to get his team's attention to get back on defense. Walker High's Jalen Cook (14) was named the Gatorade Player of the Year for Louisiana on Friday. Walker High's Jalen Cook (14) had 56 points in his team's two state tournament games. 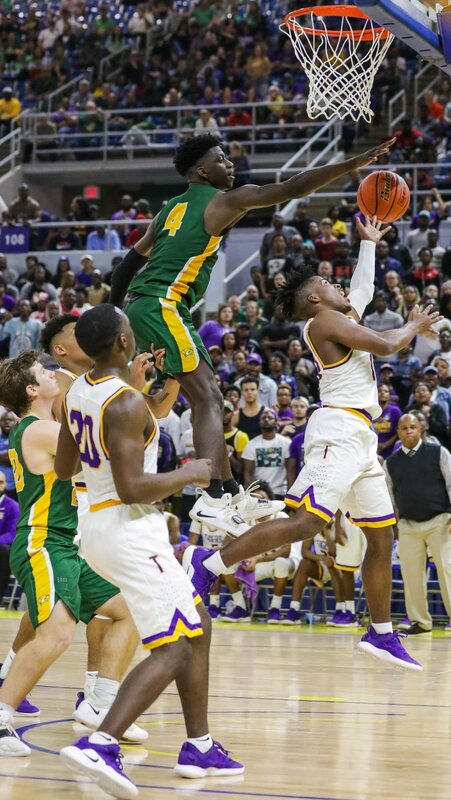 Walker High's Jalen Cook (14), shown in the state championship game against Thibodaux, averaged 29.5 points during the season along with 5.1 rebounds and 4.7 assists. Walker High's Trent Montgomery (30) and Brian Thomas (4) elevate to defend Thibodaux High's (40).